The Sohae Satellite Launching Station has far better facilities than the Tonghae Satellite Launching Ground on the country’s northeast coast. Recent satellite imagery shows that new work took place between February 16th and March 2nd. Two cranes have been added to the site. The rail-mounted transfer building has also been rebuilt with new walls and a roof. And materials that have been seen stacked next to the building a few months ago, have apparently been removed. The data was analyzed by the CSIS, who assessed that the developments are "deliberate and purposeful." The report claims the regime is rapidly rebuilding the rocket site, adding that the renewed activity "may indicate North Korean plans to demonstrate resolve" following the collapsed summit in Hanoi. The previous day at the National Assembly, South Korea's National Intelligence Service said the site showed signs of restoration work ahead of the summit. NIS Director Suh Hoon highlighted that the North may have intended to maximize the effect of the site's destruction, if they got the desired outcome from the summit. Or they may be considering launching long-range missiles at the site again, should the denuclearization talks fail. North Korea did not appear to be making much progress on dismantling the Dongchang-ri missile engine testing site, as it promised in the Pyeongyang Joint Declaration signed in September 2018. According to 38 North on 08 November 2018, commercial satellite imagery indicated there hadn't been any progress since August, when the regime removed components from its vertical engine test stand. The North Korea monitoring website adds, combined with vehicle movements at the entrance to the site, the image suggests a low level of activity continuing at the facility. On 19 September 2018, during his summit with Kim Jong-un, South Korean President Moon announced that "North Korea has agreed to permanently close the Dongchang-ri engine testing and missile launch site in the presence of experts from relevant countries. In line with corresponding measures by the United States, North Korea says it will go further by, for example, scrapping the Yeongbyeon nuclear facility." The DPRK suspended work on the dismantling of facilities at the Sohae test missile range in the west of the country. This was reported 23 August 2018 by the Washington-based 38 North North Research Group. 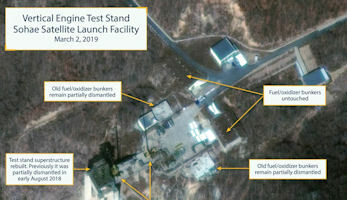 According to the analysis of satellite images published on its website, no visible dismantling operations have taken place on the test stand and launch pad since 3 August. According to experts, the same goes for the vertical test bench for engines, much of which was dismantled in July. Now the elements of the design and remain to lie on the ground. The research team did not record any changes in the structure of the launch pad and the nearby buildings. At the same time 38 North notes that the number of trucks at the landfill decreased slightly compared to July. North Korea seemed to be keeping the promise it made to Donald Trump in June 2018 about dismantling its missile engine test site. US-based North Korea monitoring website 38 North said on 23 July 2018 that new commercial satellite images of the Sohae Satellite Launching Station,.. which is the regime's main space vehicle launch site, show the North has started dismantling key facilities. They include, a rail-mounted processing building, where rocket parts are assembled, and the rocket engine test stand, used for developing liquid-fuel engines for ballistic missiles and space launch vehicles. In the satellite images of the site taken on July 20th and July 22nd, the roof and support structures of the rail-mounted processing facility have been progressively and partially taken down. Cranes were also spotted in the area, and the test stand superstructure has been completely dismantled. Considering that the dismantled facilities were key parts of the regime's Intercontinental ballistic missile program, 38 North said such efforts are a significant step by North Korea. South Korea's Blue House National Security Office Deputy Director Nam Gwan-pyo also welcomed the move as a step towards the regime's denuclearization. But while the dismantling of the facility is a positive sign, the US was likely to wait until the facility is completely dismantled before praising the North's initiative. If Pyongyang completely dismantled the facility without any conditions, it had taken the first step in building trust with the U.S. and can ask the same from Washington. But if the initial stages of dismantlement are simply being done to receive something in exchange, it's not strong enough to get the US to move. But regardless, the U.S. is not likely to give North Korea anything like the much coveted declaration to end the Korean War in exchange. This way of 'give one, get one' exchange is not what the US wanted, as it not only gave North Korea the lead but also did not follow the process of declaration, inspection and verification. The launch facility at Pong-Dong-Ni is located on North Korea's west coast. The name Pongdong-ni comes from the practice of applying names to facilities based on the nearest named population center. Both Pongdong-ni and Kwi-Gol were reportedly partially demolished during the construction of the facility. An alternative spelling, Pongdong-ri has also been used to describe the facility, as have the names Tongchang-ni, Tongchang-dong, and Dongchong-ni. As of June 2009 the actual name of the facility was unclear. Signs of construction were visible during the early 1990s and became more pronounced by the early 2000s. The west coast facility as of 17 February 17, 2009 did not have all its service levels and no gantry crane. Much of the hardware was observed lying on the ground meaning it was not ready for use. A considerable push was seen between then and June 2009 to ready the facility for operational use. The launch facility seen in 3 June 2009 satellite imagery was very close to being finished with little to no evidence of construction materials indicating continued work. Of importance was the gantry umbilical tower with no gantry crane implying that the booster would be brought to the pad fully assembled with the payload. A booster fully assembled would obviate the need for such equipment to assist in on site assembly. An approximately 40 meter long erector transporter, as seen in 26 March 2009 imagery of the launch site at Musudan-ri would likely have been used to erect the assembly. In the image no personnel or vehicular traffic was present. The a new concrete road to enter the MIK building appeared to have been recently used, suggesting the arrival of the booster payload third stage during the weekend of 30 May 2009. There was also separate horizontal assembly MIK building and a separate payload and last stage processing center. The separate MIK building for payload processing was likely for the third stage, as well as the payload. The separate MIK building for payload processing would likely be for the third stage, as well as the payload including test firing RCS systems building and explosive processing area buildings. There was also no evidence of personnel activity at these portions of the facility in the 3 June 2009 imagery. As of 3 June 2009 it was not possible to identify a launch control center or VIP viewing areas. Nor was it possible to identify other sites for mobile telemetry and mobile radar tracking equipment. Launch control facitlity could have been underground. On 14 December 2012 the dear respected Marshal Kim Jong Un, first secretary of the Workers' Party of Korea (WPK) and first chairman of the DPRK National Defence Commission visited the Sohae Space Center located in Cholsan County, North Phyongan Province to congratulate scientists and technicians on their great contribution to the successful launch of the second version of the satellite Kwangmyongsong-3. He, who is also supreme commander of the Korean People's Army, arrived there at dawn by making a long trip along a snow-covered road. Noting that the scientists and technicians of the DPRK successfully implemented the last instruction of Kim Jong Il to lift off a scientific and technological satellite in 2012 which marks the centenary of birth of President Kim Il Sung at a time when the whole country is pervaded with boundless yearning and reverence for Kim Jong Il, he expressed thanks to them in the name of the WPK Central Committee. The US-Korea Institute at Johns Hopkins University said in May 2014 that satellite images of the North's Sohae rocket launch site suggested one 'and maybe more' recent tests on the engine of what is probably the first stage of a road-mobile ICBM called the KN-08. It was the latest in a series of similar tests -- dating back to mid-2013 -- on a missile with a targeted range of up to 11,000 kilometers (6,800 miles), the institute said. North Korea can fire long-range missiles significantly faster, following upgrades to its launch sites, a U.S. expert observed in June 2014. 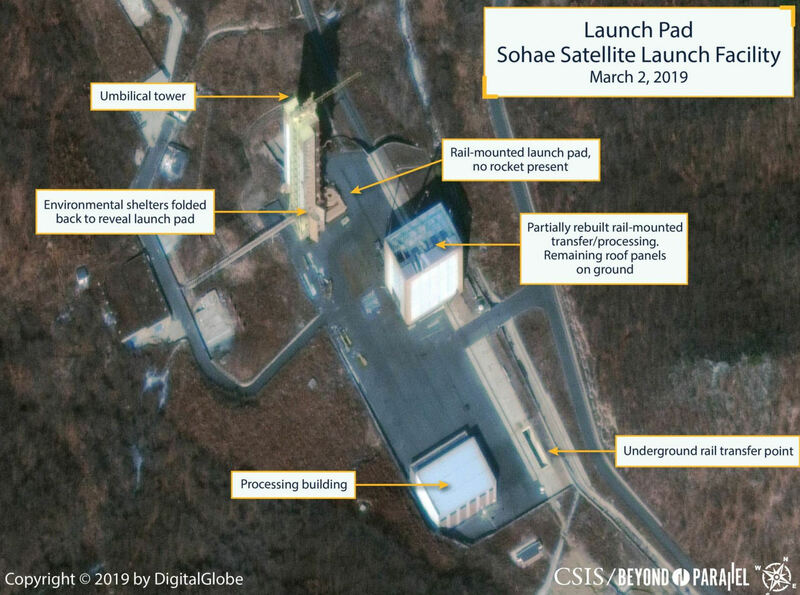 Satellite imagery analyst Nick Hansen told the VOA Korean Service that improvements at the Sohae Satellite Launching Station on the Yellow Sea had cut two weeks off a process that used to take 45 days. Pyongyang does not appear likely to be fire long-range missiles anytime soon. Through images he purchases from satellite companies, the Johns Hopkins University researcher said ongoing construction at the facility would likely make it inoperable for several more months. The US-Korea Institute released satellite imagery 29 July 2014 indicating North Korea may be nearing completion of construction and testing leading to long-range missile and satellite launches. 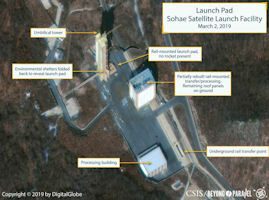 The US-Korea Institute's 38 North website released satellite imagery suggesting that activity at its Sohae Satellite Launching Station means it is preparing for long-range ballistic missile and satellite launches. It said the height of the gantry for launches had been increased to over 50 meters and expected construction of an associated rail spur and road to accommodate larger rockets would be complete in 2015. North Korea appeared to be putting the finishing touches on a number of upgrades to a rocket launching site near the West Sea. Using recent satellite imagery, the U.S.-based website 38 North said 22 August 2014 modifications to the Sohae Satellite Launching Station should be complete by the fall, opening the door for possible launches by the end of 2014. 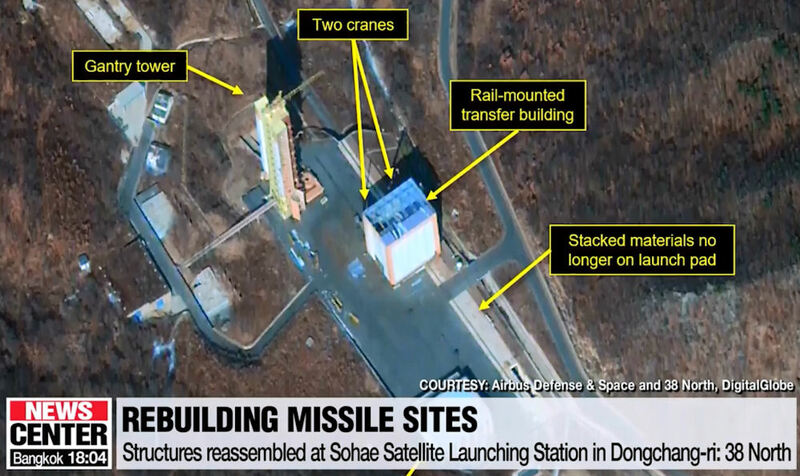 The upgrades mean Sohae would be capable of handling rockets much larger than the Unha-3 launched from site in 2012. North Korea said that rocket was part of a peaceful space program, but South Korea and the US remain concerned that the advancements in technology mean Pyongyang is getting closer to developing an inter-continental ballistic missile. By October 2014 North Korea had completed a major program to upgrade the Sohae satellite launching station that begun late in 2013. A gantry tower was raised to 55 meters by adding three new platforms to handle up to 50 meter-long rockets. The existing launch pad has been upgraded to launch rockets even larger than the Unha-3 North Korea sent into space in late 2012. With the completion of the engine test, 38North says Pyongyang may decide to test-fire another rocket before the end of 2014. A new, even larger rocket than the Unha-3 is also reportedly under development, but the website says it'll be several years before it's fully operational. Nick Hansen, an expert on imagery technology and an affiliate of the Center for International Security and Cooperation at Stanford University, told VOA's Korean Service on 04 October 2014 that two new buildings at the Sohae Satellite Launching Station could be a missile inspection facility for potential foreign buyers. “There is the sales aspect that [the North Korean regime] may be still clinging to,” he said. 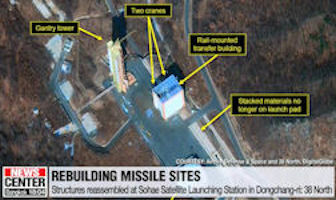 Hansen released an analysis of the latest satellite imagery on 38North.com, a web site devoted to North Korea analysis. Based on recent commercial satellite imagery, Hansen wrote, North Korea appears to have "completed a major construction program" at Sohae, which began late in 2013. Hansen told VOA the construction of two domed buildings and a nearby concrete pad needed the attention of North Korea watchers.